I discovered the Urban Earth Mother. She wasn't hiding. Heraclitus said "Nature loves to hide." I agree. I never thought I would see her with my own eyes, but she was there. Yet, I have. Somewhere between Texas Imbolc and Pantheacon, I found myself with long layovers at Chicago’s O’Hare airport and that is when I found her. I am saddened to announce the passing of long-time member Robin (Beket) Arnhold. Beket, from Eau Claire, Wisconsin,. Beket was a life member of ADF, who joined ADF in early 1989. 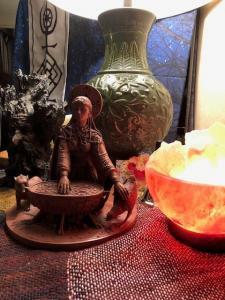 She was an important figure in the neo-pagan community and Circle Sanctuary described her as “a Pagan Elder, writer, editor, networker, merchant, astrologer, and Weather Witch”. She was closely aligned to the God Lugh and the Goddess Brighid. High Days come and go eight times a year. Devotional practices can happened much more regularly, even on a daily basis. What can someone do if they want to develop a monthly, weekly, or daily practice? This series of articles will investigate building a devotional practice with the Three Realms, namely, Land, Sea, and Sky. We will look at Lunar-based devotional practices when we discuss the Sky realm. This is part of our continuing focus on devotional practice. I wanted to give you the details of some of the items in front of the Mother Grove recently. A select committee of Mother Grove members is working through the SWOT Analysis that was completed earlier this year. We are currently working through that work and will report our findings as they become available. We are reviewing the appointment process and hope to have a finalized policy available soon. Greetings! I just returned from Texas Imbolc in Texas and I must admit it is an excellent ADF festival, full of excellent workshops, rituals, and wonderful fellowship. Held at the beautiful U-Bar-U Ranch, it is a great way to begin the festival season. As I mentioned last month, I would like to begin each ADF festival with the first workshop addressing Consent and I am very pleased to announce that the first workshop at this festival was an airing of the “Consent Tea” video followed by a discussion with the attendees. Imbolc and Lughnasadh blessings to People all across the world! The seasons and their cross-quarters dance hand in hand across the hemispheres. The increasing light of Imbolc and the great fires of Lughnasadh give us cause to celebrate!